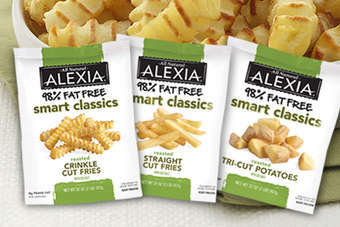 US frozen foods producer Alexia Foods has added to its portfolio with the launch of a Smart Classics Fries line. The fat-free fries contain 100 calories per serving and are made using US-grown Yukon Select potatoes, the company said. The range is available in three varieties: straight-cut fries, crinkle-cut fries and skillet-style, tri-cut potatoes. The Alexia Smart Classics are sold in 32oz packages and have an RRP of US$3.29.